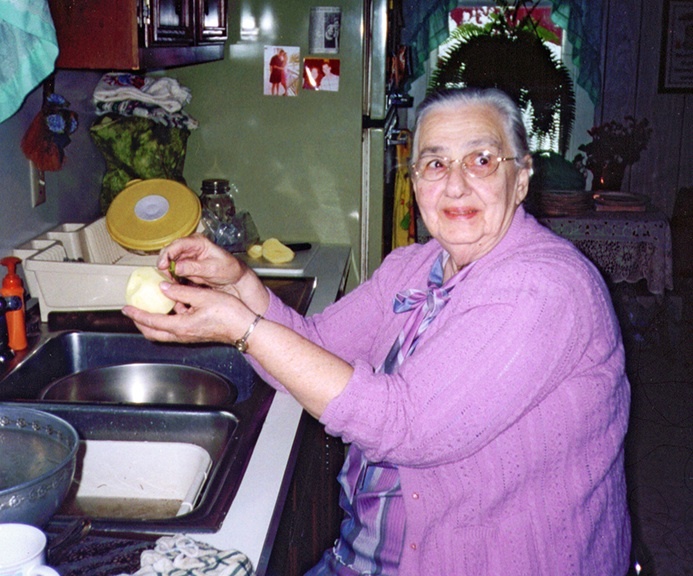 My Mother loved her kitchen with a spiritual passion and was happiest at the altar of her stove, cooking or baking. We’d hear her off-key voice singing “Heavenly Sunlight” or “Keep on the Sunny Side” as she fixed breakfast while we dressed and braided our hair for school. Her mother, Sadie Landis Metzler, died when she was nine, so Ruth, the oldest daughter of six, was the mini-mom milking cows and peeling potatoes before she went to school. Later, she was hired out to help another farm wife, who taught her to cook, instilling a love for fresh or home-canned ingredients with PA Dutch recipes. 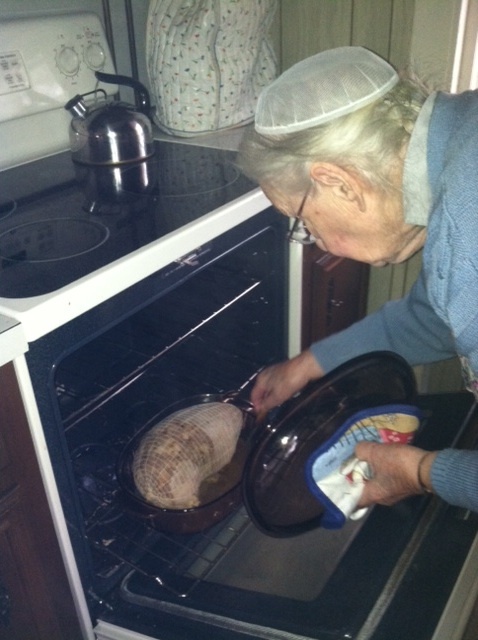 These days when I fly home from Florida, we make a feast of her famous homemade soups (vegetable & chicken corn) and other dishes, including pig stomach. It sounds horrible, like goose liver or pickled pig’s feet, but it’s considered a delicacy at her house. There are other names for this dish: hog maw, Dutch goose—but pig stomach is the name we grew up with. Basically, a nicely rinsed stomach from a pig is stuffed with a pound of sausage, 8 large diced potatoes, some onion, and sprigs of parsley cut up in tiny pieces, then all ingredients oven-roasted. Mom’s stand-by side dish is peas & carrots for color, celery in season, and something fruity for dessert like her gelatin fruit salad, a recipe passed around among the relatives. 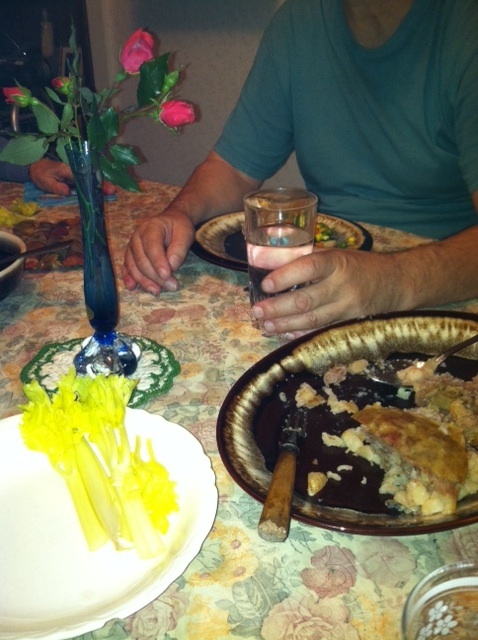 Her Salmon Casserole is also a favorite at her table. 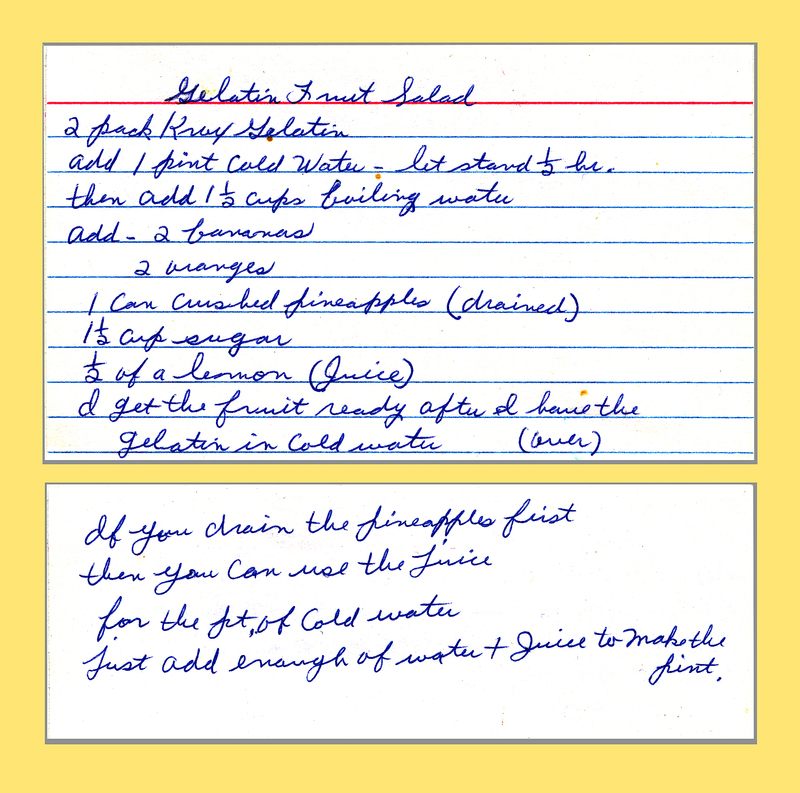 There are variations of this recipe in Mennonite Community Cookbook by Mary Emma Showalter. Scottdale, PA: The Mennonite Community Association, 1972 (16th printing). My Mom’s own recipe is quick and hearty. Snipple up (break into small pieces) salmon from the can. Place a layer of crushed cracker crumbs on the bottom of a greased 2-3 quart casserole. Alternate layers of salmon with crumbled crackers, adding a little salt and pepper as you go. Add milk. “Top off with a few hunks of butter,” she says. Bake about an hour at 350 degrees. 1 lb. butter + 2 lbs. peanut butter + 3 lbs. 10x sugar Mix ingredients together and form into egg shapes, about 1 1/2 inches diameter. 1/4 lb. butter + 8 oz. cream cheese + 2 lbs.10x sugar + coconut to taste (8 oz. bag) Follow instructions above. Coating: l lb. of semi-sweet chocolate melted. Mother would melt a pound of semi-sweet chocolate by sinking a cup of chocolate into a pan of boiling water; you may want to use something more up-to-date like a double boiler for the melting process. As the chocolate melted, she shredded in some paraffin for a glossy finish to the coating. Mom made the candies by resting each egg on a fork, dipping it into the chocolate, and then using a knife to scrape the drippy chocolate off the bottom of the egg. Pure heaven! What family favorites do you associate with a particular holiday? How have you adapted the recipes to your own table?